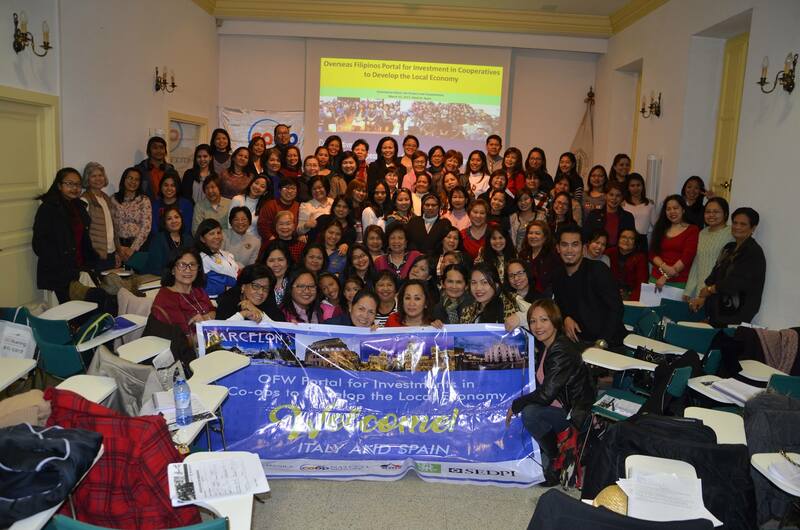 Close to a hundred overseas Filipinos, composed mainly of women, attended a lecture entitled “OFW Portal for Investments in Cooperatives to Develop the Local Economy,” last Saturday, 25 March, at the Eucharistic Temple of San Martin de Tours in Madrid. The lecture was held in celebration of the National Women´s Month. It was organized by the Philippine Embassy in Madrid in coordination with the Ateneo LSE Migration and Development Consortium, NATTCO Cooperative Network and the Association of Filipino Women in Madrid (Associación Mujeres Filipinas en Madrid). In her speech, Ms. Daisybelle Cabal, Head of the Education, Training and Consultancy Group of NATTCO, discussed how cooperatives are formed, as well as the seven international principles that govern cooperation. She explained that cooperatives help stimulate local economic growth by providing credit for food, agriculture and other enterprises. She also expounded on how a cooperative can be an investment vehicle that overseas Filipinos may wish consider to grow their savings and, at the same time, contribute to the development of their communities. The lecture formed part of Ateneo and NATTCO´s efforts to mobilize savings and investments of overseas Filipinos through cooperatives. The event was also in keeping with the Embassy´s efforts to promote gender equality and women´s economic empowerment.